One of my very best friends just welcomed a sweet baby girl to the world, so I've got ribbons and bows and all things pink on my mind! 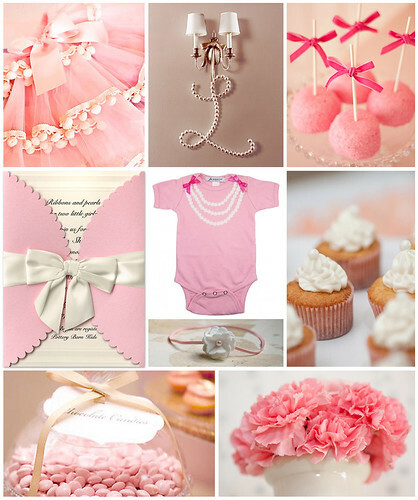 If you're planning a baby shower for a little girl, consider going ultra-girly with a ribbons, bows and pearls theme. Ribbon is inexpensive and easy to work with, making it the perfect choice when it comes to decorating. Create a ribbon garland, or simply tie tiny bows on desserts or decorations. Faux pearls are also easy to find, and can be strung onto ribbon, scattered on tabletops, or poured into glass jars. With a ribbons and pearls theme, make sure you incorporate girly pink into your palette by serving pink lemonade, pink candies and pink desserts. Your shower is sure to be just as sweet as the little girl that is soon to arrive!